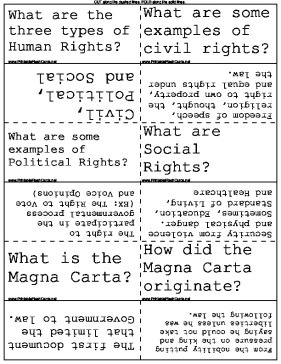 Learn about civil rights in various governments with these social studies flash cards. What are some examples of civil rights? Freedom of speech, religion, thought, the right to own property, and equal rights under the law. What is the Magna Carta? The first document that limited the Government to law. How did the Magna Carta originate? From the nobility putting pressure on the king and saying he could not take liberties unless he was following the law. Social Contract Theory proposed by Thomas Hobbes: says in the beginning man lived in a state of nature and the strongest survived. People didn't like this so they created Gov. but in doing so they gave up some liberties. What did the Mayflower Compact establish? The consent of the Governed. This is where the government can only govern when people say it can. Habeas Corpus A writ requiring a person under arrest to be brought before a judge or into court, esp. to secure the person's release unless lawful grounds are shown for their detention. What are open-ended laws? Laws that are worded in an ambiguous way such that they can be twisted and manipulated.